, a very pleasing English poet, was descended from an ancient family, settled for some | centuries at Congleton, in Cheshire. His father, of the same name, wns attached to the republican party in the reign of Charles I.; and on the restoration found it convenient to go over to Ireland, carrying with him a large personal fortune, with which he purchased estates in that kingdom. These, with the lands he had in Cheshire, descended to the poet, who was horn in 1679, in Dublin. 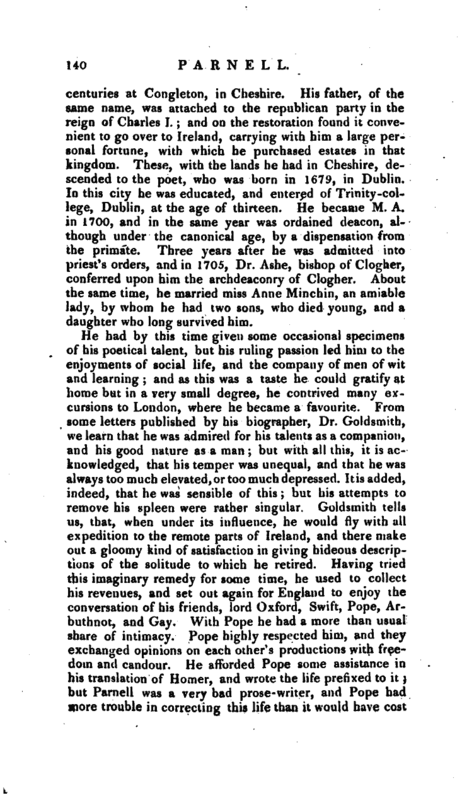 In this city he was educated, and entered of Trinity-college, Dublin, at the age of thirteen. He became M. A. in 1700, and in the same year was ordained deacon, although under the canonical age, by a dispensation from the primate. Three years after he was admitted into priest’s orders, and in 1705, Dr. Ashe, bishop of Clogher, conferred upon him the archdeaconry of Clogher. About the same time, he married miss Anne Minchin, an amiable lady, by whom he had two sons, who died young, and a daughter who long survived him. It seems probable that he had an ambition to rise by political interest. When the Whigs were ejected, in the end of queen Anne’s reign, he was persuaded to change his party, not without much censure from those whom he forsook, and was received by the earl of Oxford and the new ministry as a valuable reinforcement. 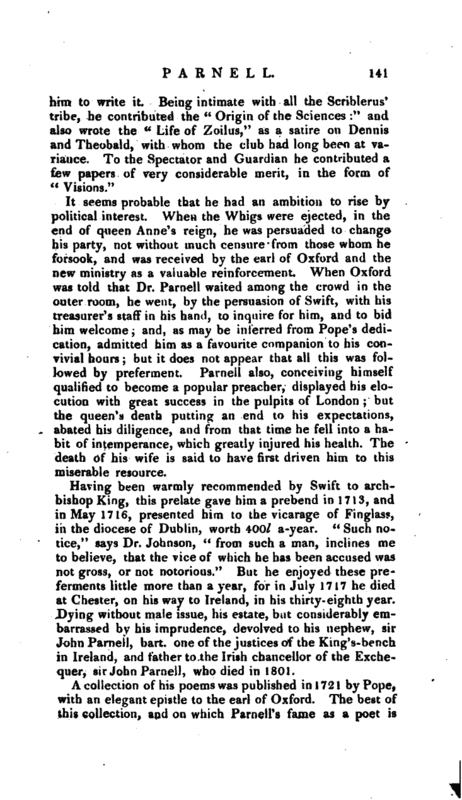 When Oxford was told that Dr. Parnell waited among the crowd in the outer room, he went, by the persuasion of Swift, with his treasurer’s staff in his hand, to inquire for him, and to bid him welcome; and, as may be interred from Pope’s dedication, admitted him as a favourite companion to his convivial hours; but it does not appear that all this was followed by preferment. Parnell also, conceiving himself qualified to become a popular preacher, displayed his elocution with great success in the pulpits of London; but the queen’s death putting an end. to his expectations, abated his diligence, and from that time he fell into a habit of intemperance, which greatly injured his health. 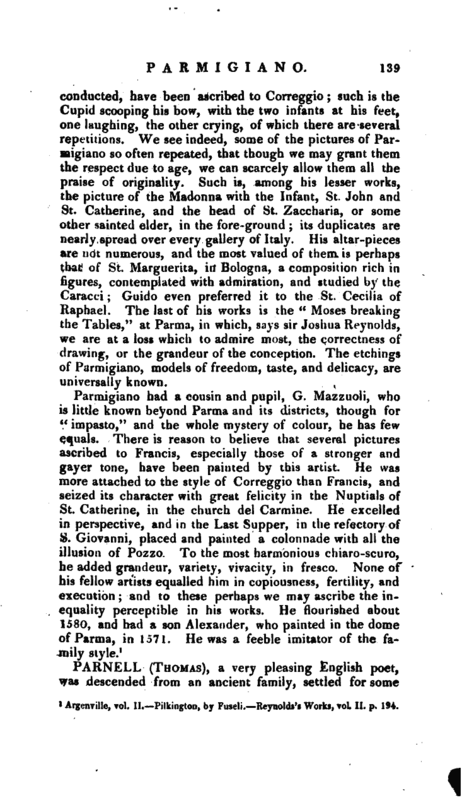 The death of his wife is said to have first driven him to this miserable resource. Having been warmly recommended by Swift to archbishop King, this prelate gave him a prebend in 1713, and in May 1716, presented him to the vicarage of Finglass, in the diocese of Dublin, worth 400l. a-year. “Such notice,” says Dr. Johnson, “from such a man, inclines me to believe, that the vice of which he has been accused was not gross, or not notorious.” But he enjoyed these preferments little more than a year, for in July 1717 he died at Chester, on his way to Ireland, in his thirty-eighth year. Dying without male issue, his estate, but considerably embarrassed by his imprudence, devolved to his nephew, sir John Parnell, bart. one of the justices of the King’s-bt-nch in Ireland, and father to the Irish chancellor of the Exchequer, sir John Parnell, who died in 1801. 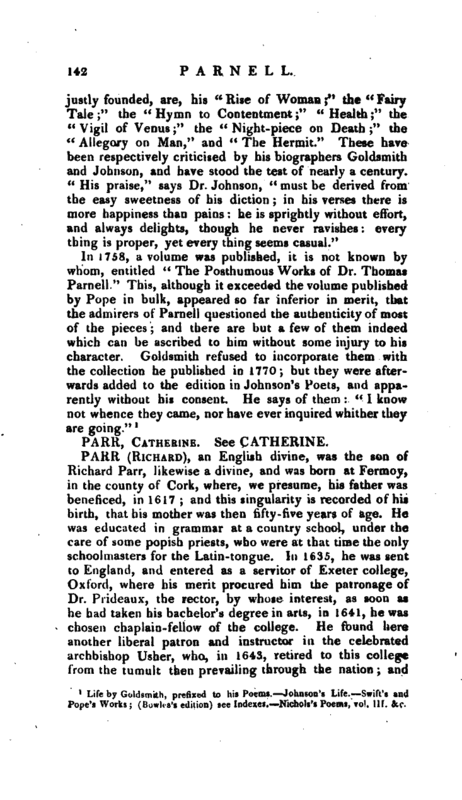 | justly founded, are, his “Rise of Woman;” the “Fairy Tale;” the “Hymn to Contentment;” “Health;” the “Vigil of Venus” the “Night-piece on Death” the <c Allegory on Man,“and” The Hermit.“These have been respectively criticised by his biographers Goldsmith and Johnson, and have stood the test of nearly a century.” His praise,“says Dr. Johnson,” must be derived from the easy sweetness of his diction,; in his verses there is more happiness than pains: he is sprightly without effort, and always delights, though he never ravishes: every thing is proper, yet every thing seems casual."